Little could he have realised it at the time, but for James Bartlett Hammond, things started to go horribly pear-shaped on the afternoon of Friday, February 8, 1907. Until that day, things had been, for 25 years, moving ahead swimmingly for Hammond and his Hammond Type Writer Company. Hammond had almost perfected his typewriter; an improved No 12 Visible was due for release in May 1907 (it was heavily marketed in 1908), and, pushing factory workers to the absolute limit, huge orders had been received from Europe, including 2000 machines headed for Germany alone. The company was valued at $1.1 million, Hammond's own personal wealth at $800,000, and Hammond was seen by his workers, according to The New York Times, as a "combination of Santa Claus and omnipotent Zeus". What could possibly go wrong? Well plenty, as it soon turned out, and all because of Hammond's own magnificent munificence. On February 8, 1907, Hammond had gathered around him his company directors, six men he believed to be loyal and trustworthy. 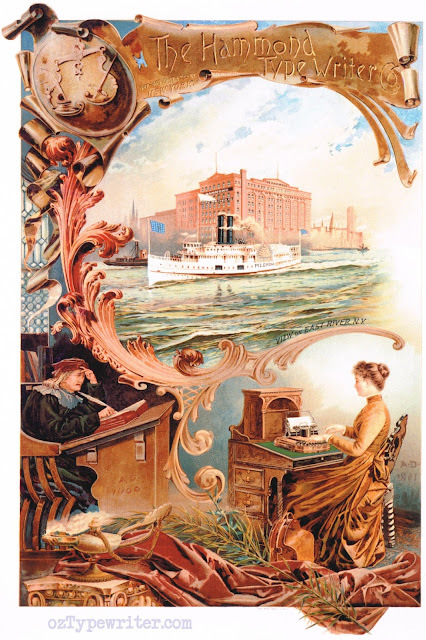 They were to hold a board meeting in the offices of the company, at 537 East 69th Street, New York City. In order for them to qualify as directors under company by-laws, and to vote on important company issues, Hammond had rewarded the six for their long-standing friendship and service, giving them each five of the company's 550 shares, with each share valued at $2000. That left Hammond himself with the remaining 520 shares. The Hammond Type Writer Company's original attorney, Elithu Root, right, is seen here in 1904 with future US President William Howard Taft, left. 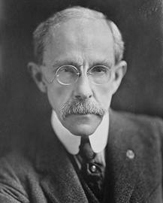 Family ties remained tight, and in 1910 Taft's younger brother, Henry Waters Taft, below, was James Bartlett Hammond's counsel when Hammond regained control of his shares in his company in the New York Supreme Court. The Hammond Type Writer Company's total stock was worth $1.1 million, the vast majority of it (about 95.5 per cent) in assets. The company had been founded and incorporated in 1880 with a $5000 investment by Hammond himself, and with future Nobel Prize winner, US Senator, Secretary of State (and, appropriately enough, War) Elithu Root (1845-1937) as his attorney. The only other cash investment ever made in the company (until it was reorganised in 1922) was another $5000 from Hammond. Capitalisation never rose above the original $50,000, just 4.5 per cent of the company's total value. 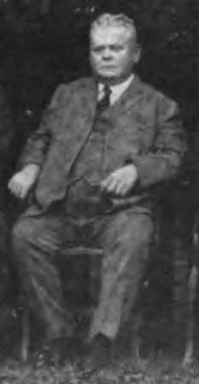 *John Milton Bancroft (b Reading, Massachusetts, 1838; d Bloomfield, New Jersey 1918), company secretary and factory superintendent. *John Anderson Ruffin (b Memphis, Tennessee, 1866), company vice-president, factory foreman and lead mechanical engineer. *Albert Bryce (1864-), English-born company general manager. *Theodore Frederick Ecklin (1861-), Swiss-born company cashier. *James Wilson Davis (1838-1908), a friend of James B. Hammond's from when they were classmates at the University of Vermont in 1857-61 and a stockholder from the company's formation in 1880. *Alexander Brough (1863-1940), Scottish-born company counsel and a future New York State senator. Under Hammond's direction, on February 8 the board members voted in favour of a massive 10 per cent pay rise for all the company's workers - backdated to January 1, 1907. 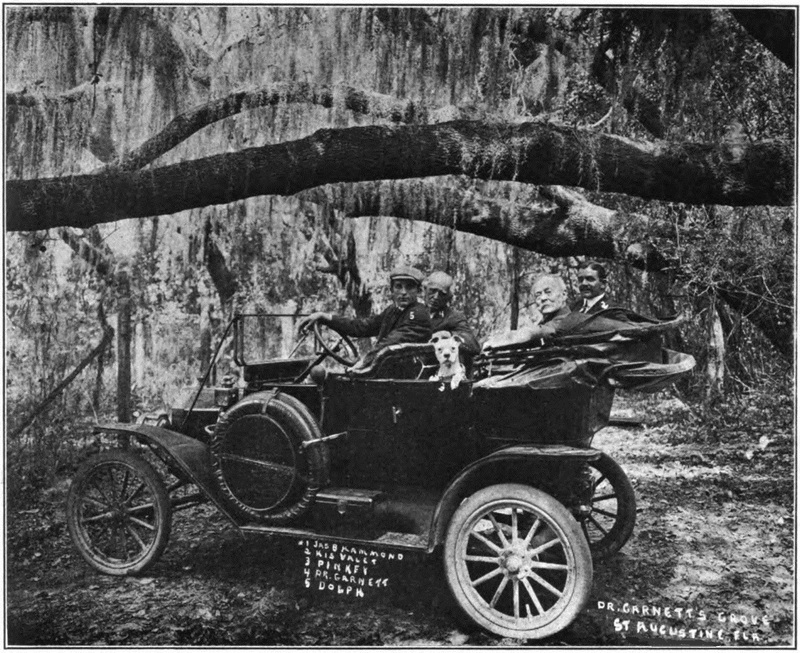 This fillip came on top of the employees' already well-established perks, privileges and other incentives: quarterly dividends of consistently more than a week's pay, a bonus of a week's wage at Christmas, and turkeys to married workers and gold coins to unmarried staff at Thanksgiving, as well as regular jaunts in the countryside in one of Hammond's five limousines. Santa Claus and Zeus indeed! Whether the February 1907 vote was unanimous or not we do not know. Hammond's old friend James W. Davis was certainly, at that point, still supportive of Hammond and his increasing generosity toward his staff, but not all the board members were. Albert Bryce, for one, thought Hammond had completely lost the plot, and was taking too little care of his wealth. Bryce obviously felt that the need to protect his own livelihood was a greater imperative than further lifting the rewards and benefits for the floor workers. Bryce, frustrated by what he interpreted as Hammond's indifference to business matters, and a cavalier attitude with his own cash, decided to take matters into his own hands. 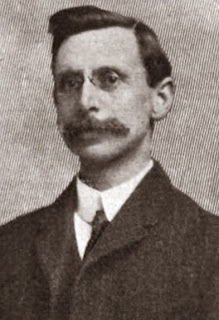 He reported the board's decision to Hammond's younger brother, Thomas Francis Hammond (1852-1924), a cash register salesman in New Rochelle, New York. As James W. Davis, "naming names", told The New York Times at the Bellevue Hospital on First Avenue in New York City on April 24, 1907, a conspiracy was hatched. Thomas F. Hammond employed the services of Pearce Bailey (1865-1922), a neurologist and psychiatrist who was a consultant at a number of New York hospitals. Thomas F. Hammond and Bryce would issue affidavits giving grounds to have James Bartlett Hammond incarcerated, and, once locked up, Bailey would have him found toxically insane and legally declared incapable of handling his own business affairs. (Evidence of this scheme was presented in a court case in February 1911 by an associate of Bailey's, "alienist" David Orr Edson; another neurologist Graeme Monroe Hammond [no relation] gave evidence in 1907 that he believed James B. Hammond had been poisoned by those attending him in Bellevue). Thomas F. Hammond would take control of the typewriter company. And thus the last six miserable years of James Bartlett Hammond's life began to unfold. Bryce, Thomas Francis Hammond and Bailey had set in motion a series of events which would ultimately prove the undoing of James B. Hammond. Almost six years to the day from that fateful meeting of February 8, 1907, Hammond died. Yet in terms of who would control his company after his death, he was to have the last laugh. James B. Hammond takes a trip along the drive with live oaks and hanging Spanish moss in the famous Orange Grove established by Dr Reuben Blakely Garnett (1838-1922) in St Augustine, Florida, just days before Hammond's death on January 27, 1913. Philip A. Wolfe took the photo. 2. WAS HE REALLY MAD? Or just suffering from 'Americanitis'? "He was always more or less eccentric," Hammond's old friend James Wilson Davis told The New York Times at the Bellevue on April 24, 1907. "His eccentricities have been exaggerated. It's a shame to have him in such a place as this. He is no more insane than I am. Mr Hammond has always been in dread lest such a thing as this should happen to him." 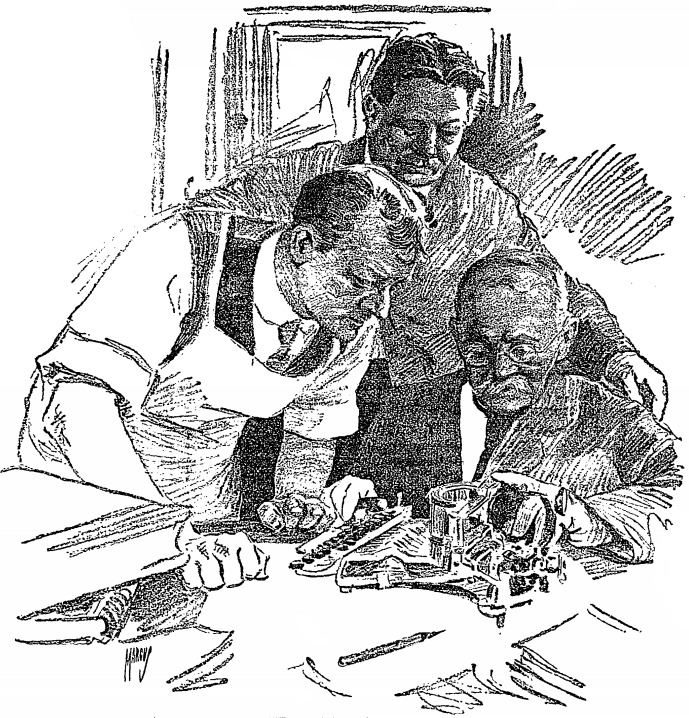 Sadly, James B. Hammond came to believe that James W. Davis had later deserted him and joined the five remaining Judases helping run the Hammond organisation, one of the board members who, in Hammond's absence in Europe in the summer of 1908, illegally usurped Hammond's 520 shares in his own company. (Albert Bryce had, not surprisingly, long since been sacked.) 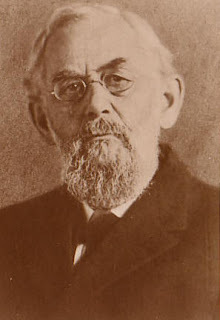 Davis died later in 1908 and his five shares in the company were snaffled by his executor, Hammond company bookkeeper Horace Greeley Allen (1873-). 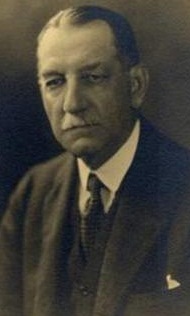 Allen duly followed the lead of the four surviving directors and tried to hold on to James B. Hammond's shares. 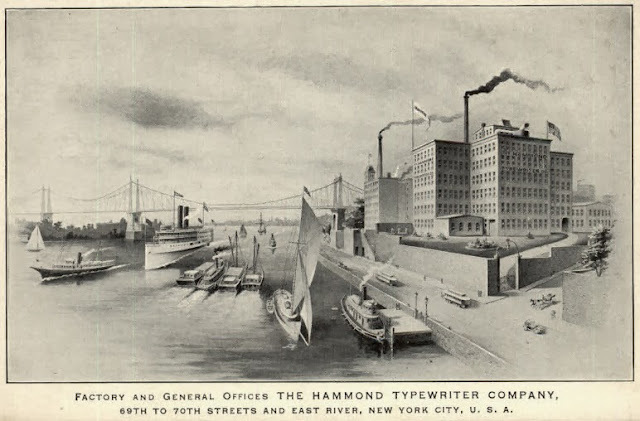 James B. Hammond confronted Horace G. Allen outside the Hammond Type Writer Company offices, at 537 East 69th Street, New York City, on Wednesday, December 9, 1908, allegedly hit Allen twice on the head with his cane, grabbed the five stock certificates and told Allen: "You're a dog and I'll put you where your friend Davis is." That is, presumably, six feet under. Allen said he took Hammond's words as a threat to murder him. On April 3, 1911, a jury decided Hammond had to pay Allen $100 in damages for the "humiliation" he had allegedly suffered that day in December 1908, an amount that was one-one hundredth of what Allen demanded ($10,000, equal to the value of the five shares Hammond had reclaimed). 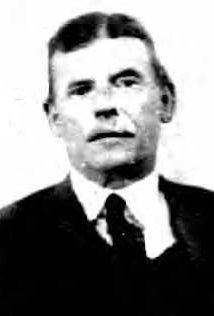 James W. Davis was one of two Hammond company directors to rush to James B. Hammond's side at the Bellevue, the day after his arrest on Tuesday, April 23, 1907. The other was the company counsel, Alexander Brough. 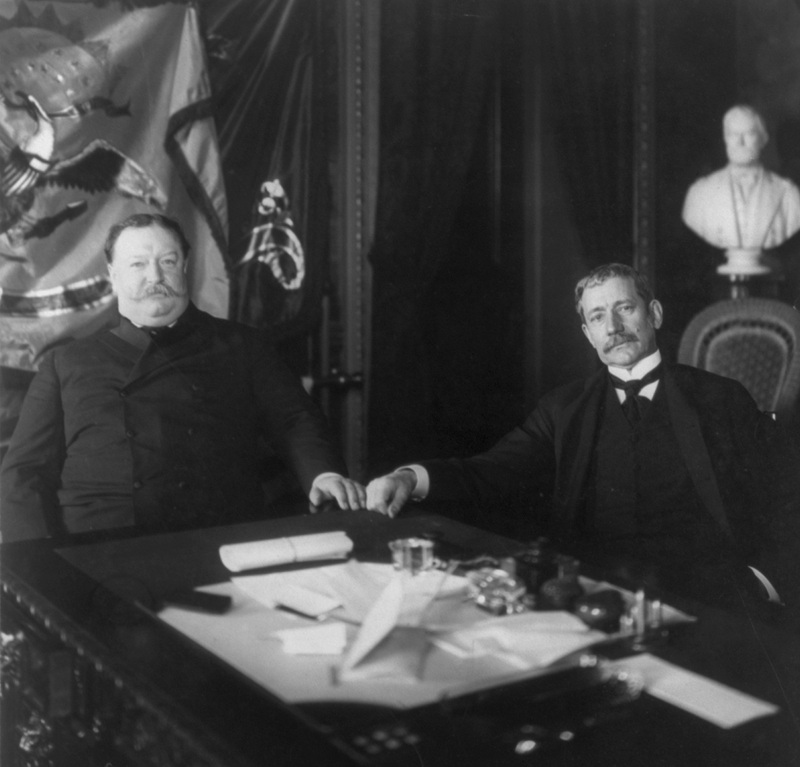 But beyond that point, Davis and Brough offered James B. Hammond so further tangible support. at the Columbia School of Mines in 1874 was James Bartlett Hammond. "He was always a little queer," testified neurologist Dr Graeme Monroe Hammond (no relation, but James B. Hammond had been his first teacher) on September 24, 1907. "When he was teaching us boys he used to bring pieces of the typewriter he was inventing to school. He seemed to think more of the typewriter than he did of his studies." And most typewriter lovers have been thanking James Bartlett Hammond for this level of preoccupation ever since. There was only one place in America where Hammond didn't get much sympathy during his 1907 incarceration, and that was Kansas. W.C. Simons opined in the Lawrence Daily World, "The man who invented the Hammond typewriter is suspected of being insane. Must be somebody else has the same opinion of the Hammond typewriter that we have always had." And Manford Schoonover twisted the knife with this piece of unfounded judgement in the Garnett Journal: [James B. Hammond's] "wealth is valued at $800,000, but his willpower and backbone wasn't worth a cent. He could manage a large business but he could not manage his personal habits." 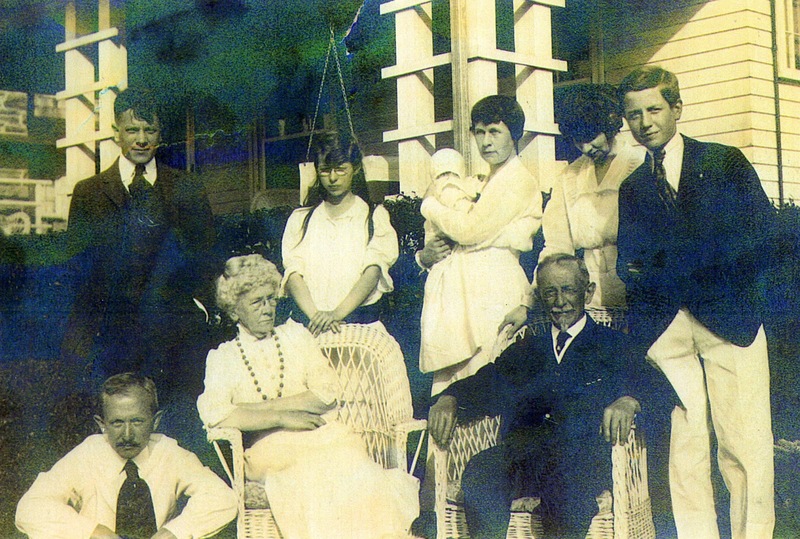 Loved by some: Thomas Francis Hammond, seated front right, with members of his immediate family. His son, noted Georgia journalist Percy Waters "Pat" Hammond (1886-1935), one-time city editor and assistant managing editor of the Atlanta Constitution, is seen standing, back left. 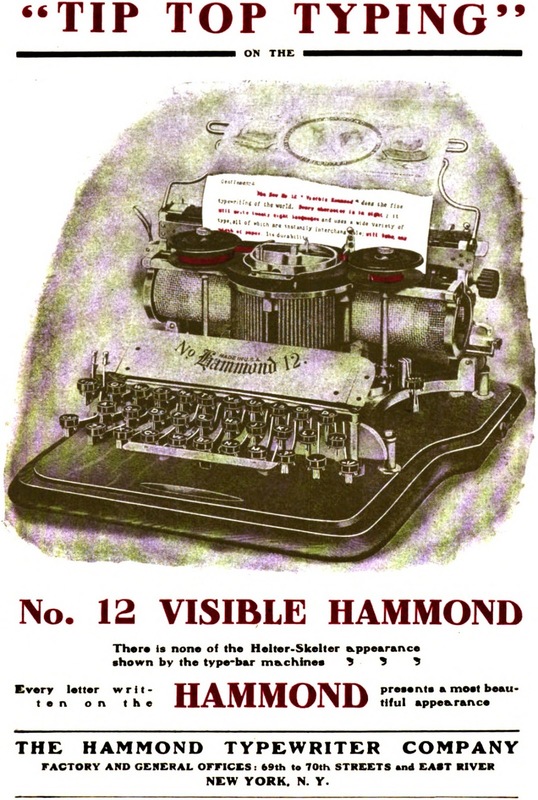 There are some members of the Hammond family, however, typewriter lovers have not been thanking. These are the people who, in the last six years of his remarkably long and eventful life, made James Bartlett Hammond a "Man of Constant Sorrow". As if perfecting his typewriter wasn't enough to send poor old JB around the bend, Hammond had been beset by people trying to illegally get their hands on his hard-earned cash since 1889, just five years after the first of his typewriters appeared. I absolutely love this sort of investigative depth in bringing events to life. It really helps one understand that the times may change, but people never do.